Rendering of military funeral honors demonstrates our Nation's gratitude to those who in time of war and peace, have defended our country. This ceremonial paying of respect is the final demonstration a grateful Nation can provide veterans' families. - Military members on active duty, or in the Selected Reserve. - Former military members who served on active duty and departed under conditions other than dishonorable. - Former military members who completed at least one term of enlistment, or period of initial obligated service in the Selected Reserve and departed under conditions other than dishonorable. - Former military members discharged from the Selected Reserve due to a disability incurred or aggravated, in the line of duty. A copy of Standard Form 180 may be obtained and printed from HERE. It is advisable that all veterans obtain a copy of their DD214 and keep it safely stored with their valuable documents or pre-arrangement papers. Members of the Commissioned Officer Corps of the Public Health Service (PHS) and National Oceanic and Atmospheric Administration (NOAA), as members of a Uniformed Service, are also eligible to receive funeral honors. For NOAA personnel, eligibility is determined using NOAA Form 56-16, Report of Transfer or Discharge. If the family does not have a copy of Form 56-16, it may be obtained by contacting the Chief Officer Services Division, NOAA Commissioned Personnel Center at (301) 713-3453, ext 102. For PHS personnel, funeral honors eligibility is established using PHS Form 1867, Statement of Service (equivalent to the DD214). If the family does not have a copy of the Statement of Service, it may be obtained by contacting the Privacy Coordinator for the Commissioned Corps at (301) 594-3064. Military Funeral Honors have always been provided whenever possible. Military Funeral Honors are provided by the Department of Defense at no charge to the family. Currently the law mandates the rendering of Military Funeral Honors for any eligible veteran if requested by the family. The funeral home undertakes the necessary paperwork on the family's behalf. As provided by law, an honor guard detail for the burial of a veteran shall consist of not less than two members of the Armed Forces. One member of the detail shall be a representative of the parent Service of the deceased veteran. The basic Military Funeral Honors ceremony consists of the playing of Taps and folding/presentation of the United States flag to the veteran’s family. The ceremony is performed by a funeral honors detail consisting of at least two members of the Armed Forces branch. The Funeral Honors rendered to the veteran will be determined by his status. The type of Funeral Honors may be Full Military Honors, a 7-man Detail, or a Standard Honors Team Detail. At least one of the funeral honors detail will be from the Armed Force branch in which the deceased veteran served. Taps is played by a bugler. Rifle salutes are provided to retired military personnel, or those servicemen killed in the line of duty. A 21-gun salute is reserved for dignitaries and heads of state and is performed with artillery. The piper is not attached to the military detail officially, but does perform and co-operate in accordance with their protocols. 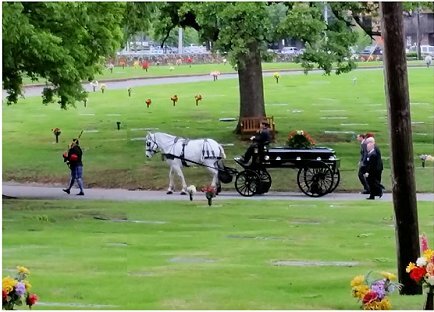 The military requests at least 48 hours in order to organize a funeral honors detail. Similar to graveside protocols of Arlington National Cemetery, the piper performs after the folded flag has been presented to the designated family member and the detail has completed their obligations. Typically, Amazing Grace is performed, but the musical selection is not limited to it alone. These described protocols do not apply at the prior funeral service that takes place at a separate location. There the piper can perform in a similar fashion as described in the Civilan section of this website. On many occasions, I have piped the deceased veteran's casket or urn to graveside. As long as it does not interfere with the military detail, there will be no objections.